Introducing you to our latest collection from Dovecraft, Nature’s Grace, designed by the wonderful Stephanie Davies. With its beautifully illustrated papers and range of matching embellishments, we have totally fallen in love with this stunning collection and we think that you will too! Ideal for a variety of projects, the Nature’s Grace papers are illustrated with a flurry of beautiful butterflies, birds and dainty florals. The yellow, grey and purple colour palette makes this collection perfect for a range of occasions. The beautifully designed papers paired with the charming embellishments will allow you to capture the magic of nature in every single craft. We’ve got so many project ideas and we can’t wait to see what you create with it too! So many goodies! The intricate designs of the papers are also captured in the embellishments. This wonderful collection includes mini bunting, paper flowers, mini pegs, paper doilies, buttons, accordion stickers, and more! We just had to include washi tape in this collection and look at the detail on this tape! Featuring a beautiful illustrated floral design, fluttering butterflies and birds, this tape is perfect for all of your papercraft projects! So much eye-candy - we really can’t get over how pretty these embellishments are! The crafty possibilities for this collection are endless! I think we can all agree that Dovecraft Nature’s Grace is seriously stunning! 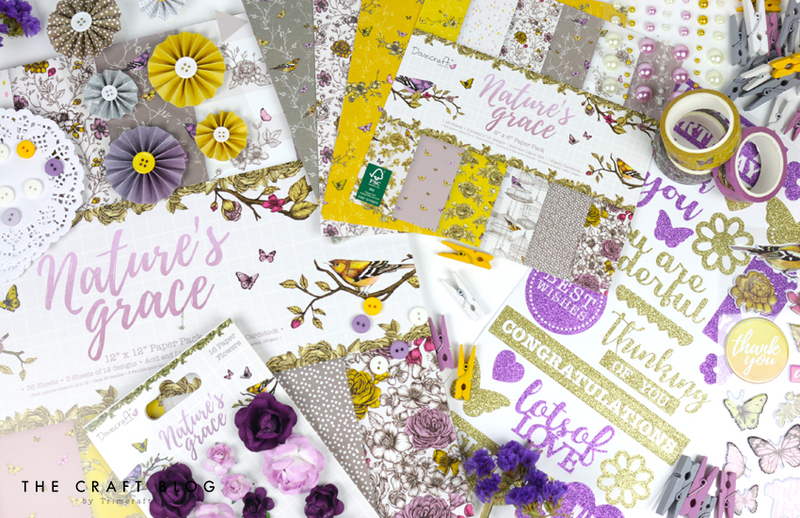 What do you think of the beautiful new Dovecraft Nature’s Grace collection? Make sure to keep your eyes peeled in stores in the next few weeks to pick up your own. We can’t wait to see how you use these designs in the Inspiration area!